It is said that "cooking is magic and baking is science". That is even more sound advise when you look at some cookbooks that never seem to agree on amounts. Often cookbooks have terms like, "rounded tablespoon" or "cup of sifted flour", a "dash" a "pinch" or even a "sprinkle" of this or that. So what are these terms and how much ARE these amounts? It's easy when you're cooking to add most of these amounts as we go along. You need a dash of salt, you reach over to you salt cellar and "dash" some salt between your thumb and forefinger and add it to the dish. You need a pinch of something? Grab a little more between your fingers. If you need a sprinkle of some thing, grab the tin of spice and sprinkle some on your favorite food! All pretty easy, huh? Well if you were your mother or grandmother cooking or baking was pretty simple. 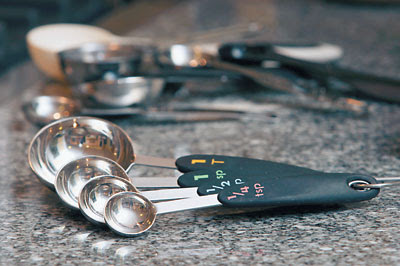 They often did not rely on a cookbook, but on first person instruction. It was with the advent of modern cookbooks that the need arose to quantify those abscure terms. You can find some measuring spoons with the amounts at your local specility shop or you can just remember the following. A sprinkle is less than a dash and a dash is less than a pinch. 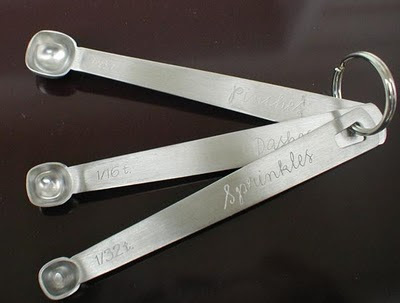 For those of us that need the exact amounts spinkle = 1/32 of a teaspoon, dash = 1/16 of a teaspoon and a pinch = 1/8 of a teaspoon.